Background and aims Intra-specific variation in root system architecture and consequent efficiency of resource capture by major crops has received recent attention. The aim of this study was to assess variability in a number of root traits among wild genotypes of narrow-leafed lupin (Lupinus angustifolius L.), to provide a basis for modelling of root structure. Methods A subset of 111 genotypes of L. angustifolius was selected from a large germplasm pool based on similarity matrices calculated using Diversity Array Technology markers. Plants were grown for 6 weeks in the established semi-hydroponic phenotyping systems to measure the fine-scale features of the root systems. Results Root morphology of wild L. angustifolius was primarily dominated by the taproot and first-order branches, with the presence of densely or sparsely distributed second-order branches in the late growth stage. Large variation in most root traits was identified among the tested genotypes. Total root length, branch length and branch number in the entire root system and in the upper roots were the most varied traits (coefficient of variation CV >0.50). Over 94% of the root system architectural variation determined from the principal components analysis was captured by six components (eigenvalue >1). Five relatively homogeneous groups of genotypes with distinguished patterns of root architecture were separated by k-means clustering analysis. 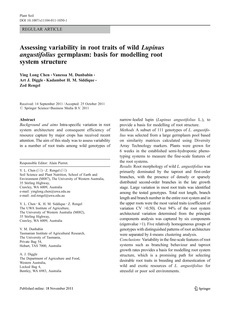 Conclusions Variability in the fine-scale features of root systems such as branching behaviour and taproot growth rates provides a basis for modelling root system structure, which is a promising path for selecting desirable root traits in breeding and domestication of wild and exotic resources of L. angustifolius for stressful or poor soil environments.